On Saturday, Sept. 26, Georgia Southern will present its 3rd annual science, technology, engineering and mathematics (STEM) festival from 10 a.m. until 4 p.m. in the Nessmith-Lane Conference Center. The festival provides more than 50 exploration stations with hands-on learning activities for elementary-, middle school- and high school-aged children. The event is free and open to the public. STEM Fest is an interactive event intended to get K-12 students excited about what STEM has to offer by offering students, their parents and teachers hands-on educational experiences. The festival will feature presentations by the Institute for Interdisciplinary STEM Education (i²STEMe) at Georgia Southern, the U.S. Army and others. This year, activities include robotics in action, making ice cream with liquid nitrogen, experiencing the STE(A)M truck, a mobile innovation lab, launching Alka-seltzer rockets, exploring the Archeobus with the Society for Georgia Archeology, going on a mission with the army and learning more about the U.S. Environmental Protection Agency. Georgia Southern’s i²STEMe brings a workforce development and more STEM literate citizenship to the community to assist in making more informed decisions about issues that are going to affect the next generation. The Institute also aims to establish collaborative interdisciplinary programs committed to excellence in K-20 STEM teaching and learning, with a focus on rural, diverse, low SES and under-represented populations. 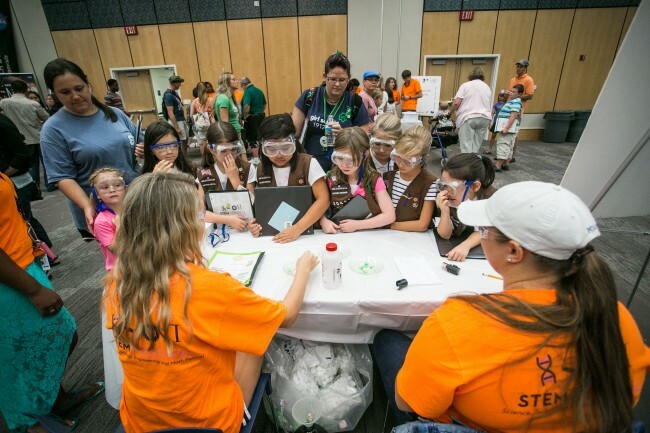 Last year more than 1,500 guests attended STEM Fest and this year the University expects more.